The Government has persistently ignored calls for a full assessment of the impact of Welfare, Social Care and NHS reform on disabled people and their families. The number of households with a disabled family member living in “absolute poverty” increased by 10% between 2013 and 14. Absolute poverty isn’t the same as relative deprivation – our usual measure of poverty – absolute poverty means that people can’t meet their basic needs, such as access to food, fuel or shelter. Since the WoW petition collected 104,000 signatures, the Government has claimed the Institute for Fiscal Studies (IFS) have said it was too difficult to do a Cumulative Impact Assessment (CIA), the IFS subsequently contradicted the claim and said it could be done. EHRC and the Social Security Advisory Committee have also called for a CIA of how cuts have affected disabled people and their families. A CIA undertaken by Landman Economics, the National Institute of Economic and Social Research and The Centre for Welfare Reform have demonstrated that disabled people have been hit the hardest by austerity cuts. “The Government is committed to a fair tax and welfare system where everyone contributes to reducing the deficit, and where those with the most contribute the most. Every individual policy change is carefully considered, including looking at the effect on disabled people in line with legal obligations. The Conservatives have since claimed to make welfare provision “fair” by introducing substantial cuts to benefits and introducing severe conditionality requirements regarding eligibility to social security, including the frequent use of extremely punitive benefit sanctions as a means of “changing behaviours,” highlighting plainly that the Conservatives regard unemployment and disability as some kind of personal deficit on the part of those who are, in reality, simply casualties of bad political decision-making and subsequent policy-shaped socio-economic circumstances. The word “fair” originally meant “treating people equally without favouritism or discrimination, without cheating or trying to achieve unjust advantage.” Under the Conservatives, we have witnessed a manipulated semantic shift, “fair” has become a Glittering Generality – part of a lexicon of propaganda that simply props up Tory ideology in an endlessly erroneous and self-referential way. It now signposts an intentionally misleading Conservative narrative, constructed on the basic, offensive idea that people claiming welfare do so because of “faulty” personal characteristics, and that welfare creates problems, rather than it being an essential mechanism aimed at alleviating poverty, extending social and economic support and opportunities – social insurance and security when people need it. Rising wealth – 50 richest people from this region increased their wealth by £3.46 billion last year to a record £28.5 billion. Falling taxes – top rate of tax cut from 50% to 45% for those earning over £150,000 a year. This is 1% of the population who earn 13% of the income. The wealthiest had a tax cut of £170, ooo each per year. No mansion tax and caps on council tax mean that the highest value properties are taxed proportionately less than average houses. Meanwhile, those previously exempt from council tax claiming social security now have to pay due to reductions in their benefit. Tax free living – extremely wealthy individuals can access tax avoidance schemes which contribute to the £25bn of tax which is avoided every year, as profits are shifted offshore to join the estimated £13 trillion of assets siphoned off from our economy. As a consequence of the highly discriminatory and blatantly class-contingent Tory policies, inequality in the UK has risen to the highest level amongst all EU countries, and tops even the US. Rampant socio-economic inequality apparently is the new Tory “fair”. The rise in the need for food banks in the UK, amongst both the working and non-working poor, over the past five years and the return of absolute poverty, not seen since before the advent of the welfare state in this country, makes a mockery of government claims that it supports the most vulnerable. Income tax receipts to the Treasury have fallen because those able to pay the most are being steadily exempted from responsibility, and wages for many of poorer citizens have fallen, whilst the cost of living has risen significantly over this past five years. The ideologically motivated transfer of funds from the poorest half of the country to the more affluent has not contributed to deficit reduction. It doesn’t take a genius to work out that the cumulative impact of Tory tax and welfare changes, from out-of-work and in-work benefits to council tax support, to the cut in the top rate of income tax and an increase in tax-free personal allowances, has been extremely regressive and detrimental to the poorest. The revenue gains from the tax changes and benefit cuts were offset by the cost of tax reductions, particularly the increase in the income tax personal allowance, benefitting the wealthiest. The Treasury response to this is to single out the poorest yet again for more cuts to “balance the books” – which basically translates as the Conservative “small state” fetish, and deep dislike of the gains we made from the post-war settlement. Yet for a government that claims a non-interventionist stance, it sure does make a lot of interventions. Always on behalf of the privileged class, with policies benefitting only the wealthy minority. How can Conservatives believe that poor people are motivated to work harder by taking money from them, yet also apparently believe that wealthy people are motivated by giving them more money? This is not “behavioural science,” it’s policy-making founded entirely on traditional Tory prejudices. The government claim that “Every individual policy change is carefully considered, including looking at the effect on disabled people in line with legal obligations,” but without carrying out a cumulative impact assessment, the effects and impacts of policies can’t possibly be accurately measured. May I suggest that the government listens to disabled people, instead of dismissing our evidenced, valid accounts of the negative impacts of policy as “anecdotal” and attempting to invalidate our experiences. Policies ought to be about meeting identified public needs, that’s what we elect governments to do in democracies. Democracy means that the voices of citizens, especially members of protected social groups, need to be included in political decision-making, rather than so frankly excluded and rather than having their experiences negated by a bullying, aggressive political denial strategy. Public policy is not an ideological tool for a so-called democratic government to simply get its own way. The government have persistently simply denied any accounts of the adverse consequences of their policies on disabled people, and have refused to effectively monitor policy impacts, indicating plainly that it values perverse ideology much more than it values the lives of real people. Furthermore, the claim that “it is not possible to carry out a cumulative assessment of the impact of policies on disabled people” doesn’t stand up to scrutiny in the face of the various assessments carried out by a variety of under-resourced organisations, academics and campaign groups. I suggest that the government pays attention to the findings of these important pieces of research, and learns from them, especially concerning how to research effectively, how to formulate evidence-based policies and how to budget for impact assessments, because if severely underfunded organisations and charities can manage that, so can the government. It’s a matter of priorities. If the government had paid attention to laws, including international ones, as claimed, instead of trying to edit out the parts that are inconvenient to them, then there would be no need for the United Nation’s inquiries into human rights violations of disabled people, and the negative social, economic and cultural impacts of their welfare “reforms” on vulnerable social groups. The MPs called for an independent review into benefit sanctions, and said that they were “causing severe financial hardship” and are behind the rise in food banks. It was reported that the Department for Work and Pensions has investigated 49 cases where a claimant has died. Of these, 40 involved a suicide, the Work and Pensions Select Committee said. But the DWP was unwilling to say how many of the deaths were a result of benefit sanctions or say if it had changed its policies as a result. The statement: “Analysis needs to take account of behaviour change of reforms rather than the more limited approach of focusing solely on benefit changes” is another indication of this government’s perverse ideological commitment as opposed to any commitment to upholding political obligation towards meeting the needs and promoting the wellbeing of citizens. We elect governments to meet public needs, not to “change behaviours” of citizens to suit government needs. The government’s undeclared preoccupation with behavioural change through personal responsibility, not to be found in their manifesto, is just another revamped version of Samuel Smiles’s bible of Victorian and over-moralising hobby-horse: “thrift and self-help” – but only for the poor, of course. Smiles and other powerful, wealthy and privileged Conservative thinkers, such as Herbert Spencer, claimed that poverty was caused largely by the irresponsible habits of the poor during that era. But we learned historically that socio-economic circumstances caused by political-decision making creates poverty. This government endorses the proliferation of insecure, low paid work, welfare that punishes people to the point of desperation, with no regard for their life or wellbeing, in order to “incentivise” them to take any job, (no matter how poorly paid and unsuitable it is) and removing income from the poorest more generally, whilst handing out our money to the wealthy. That’s not citizens behaving “fecklessly” or irresponsibly: that’s the government. If punishing people actually worked to “help” (yet another Tory euphemism) people into work, the Department of Work and Pensions would have had no need to write fake testimonials from fake characters to attempt a nasty and ludicrous justification of benefit sanctions. The “making work pay,” approach, which is Toryspeak for retrogressive policy-making, based on the 1834 Poor Law principle of less eligibility again. The reality is that sick and disabled people are being coerced by the state into taking any very poorly paid work, regardless of whether or not they can work, and to translate the Tory rhetoric further, Duncan Smith is telling us that the government will continue to ensure the conditions of claiming social security are so dismal and brutal that few people can survive it. When we inform this government that people are dying, and that this is correlated with Tory policies, they simply deny it without any evidence to substantiate their claims. The lack of concern and instant dismissal of concerns about this correlation is not the kind of behaviour one would expect from government in a first-world liberal democracy. Making work pay for whom? Recent research indicates that not all work serves to “keep people healthy as well as promote recovery.” The assumption that work can promote recovery in the case of people with disability is both unfounded and absurd. We have yet to hear of a single case involving a job miracle entailing people’s limbs growing back, vision being restored, or a wonder cure for heart failure, cerebral palsy, multiple sclerosis and lupus, for example. The government’s Fit for Work scheme is founded on exactly the same misinformative nonsense. It supports profit-making for wealthy employers, at the expense of the health and wellbeing of employees that have been signed off work because of medically and professionally recognised illness that acts as a barrier to work capabilities. Furthermore, there is no proof that work in itself is beneficial. Indeed much research evidence strongly suggests otherwise. And where have we heard these ideas before: “Arbeit macht frei“? The Behavioural Insights Team (Nudge Unit) is an arm of government that influences and shapes experimental policies which act UPON as opposed to FOR the population, without their consent, to CHANGE PEOPLE’S BEHAVIOUR. That’s a branch of the government controlling or attempting to control people’s everyday actions without them knowing about it. Or consenting to it. It’s a dangerous road to travel down – the political notion that citizens should be totally subject to an absolute state authority is the basis of totalitarianism. The government frequently bandy around phrases and terms like “behavioural change” and “incentivising” but this is the new policy marketingspeak – as irritating and cringeworthy as meaningless corporatespeak, including soundbites – empty generalities – like “blue sky thinking,” and “upskilling.” The Nudge Unit’s behaviour theories (not “science”) are nothing more than psycho-linguisticbabble that is constructed as a prop for Tory small state ideology, and to support their aim of steadily dismantling the gains of our post war settlement. Cut by cut. It’s unacceptable in a so-called liberal democracy that a government endorses “incentivising” people (a psychocratic euphemism for state coercion) to take any insecure, poorly paid work that doesn’t alleviate poverty, by the use of sanctions, which entail the removal of people’s lifeline benefits originally designed to meet basic survival needs – food, fuel and shelter – making people desperate and placing them in situations of crisis and absolute poverty. How on earth is that “fair” and how does it “make work pay”? It’s morally repugnant, ethically reprehensible, academically nonsensical and democratically untenable. It’s not possible to “incentivise” people by starving them. The claim that “Government is committed to supporting the most vulnerable” also doesn’t stand up to scrutiny, given the Conservative policy record, including cruelly scrapping the Independent Living Fund, which as had a hugely negative impact on those trying their best to lead independent and dignified lives, and the Access To Work funding has been severely cut, this is a fund that helps people and employers to cover the extra living costs arising due to disabilities that might present barriers to work. Finally, I feel obliged to point out that the welfare “reforms” have cost far more to implement than they have saved the “tax paying” public, indicating once again that the welfare “reforms” and other austerity measures are not because of economic necessity: they are entirely ideologically motivated. I strongly suggest that We reduce the Welfare Budget by billions: by simply getting rid of Iain Duncan Smith. This is an absolutely excellent piece of journalism and should be on the front page of every mainstream paper – Well Done Sue I loved the read and all the truths. Thanks so much for the feedback, Leon, it was quite a difficult piece to write, not because of what I included, but because of what I was forced to leave out – we need a BOOK not a blog on analysing and dismantling this government’s crap ideological ranting! Agreed perhaps a few bloggers should get together and write one! Tax the wealthy, stop being mean to people with mental health problems, because you’re just making us worse. All I want to do is live as independently as I can, have a nice job, have a nice supported living with someone coming to work with me and going home. If that is being selfish and using too much tax payers money, then I am sorry Tories, but that is the only way you are going to get me to work. Supportive work environment too, where people are not going to be discriminating against my mental health problems. Honestly Kitty Sue, you are a more competent journalist writing very well presented and researched articles than any journalist reporting in the mainstream media. It’s just a shame you do not have a daily or weekly column available in one of the tabloids. Aditya Chakrabotty of the Guardian and Seumus Milne would probably praise many of your articles. Have you ever applied to the Guardian for a serialisation of some of your expert pieces – they pay for every article published and should be interested. Just a thought, seems such a waste of your talent when millions could avail themselves instead of the few thousand that have that opportunity. “Cognitive Dissonance” was another excellent blog that should reach many more people. Thanks. I always welcome feedback. I’ve never asked any of the press, partly because I started writing in 2013 because I felt so let down by them. However, there are some excellent writers – as you point out – as well as those two, I like Patrick Butler, Patrick Wintour and Frances Ryan, amongst others. Nothing I do is paid. Not because I don’t need the money – I do! I’ve never been as poor as I am now. But because I don’t want to be accused of the usual, doing it for money and fame and all of that. (Fat chance anyway!) But I’m driven by a need to share info, a framework of ideas and language others can use, and also, just to promote critical thinking. We really do have a government of blatant liars and despots. I can’t believe so much of the nation doesn’t see what we do. People don’t have to agree with what I write, but if it prompts some debate and thinking, that’s good enough for me. I’ve had stuff published before, though mostly in journals – philosophy and social science. Another excellent presentation by this reliable author with authentication and justifiable links throughout, a must read. Clear précis of the state of affairs of the welfare state. Superb! Thanks, I’ve just read it back and amended a few wild typos. It was a big piece of work fueled by utter anger and disgust at the government. This lengthy article extensively critiques the Tory’s welfare policy. It is, of course, a revival of the old Victorian doctrine that people are poor because they’re lazy, or feckless, rather than because the economy is unfair. And the article also critiques the Tories’ use of the word ‘fair’, to show how their manipulation of the term is allowing them to carry on most unfairly. The Labour government introduced legislation to make sure that certain vulnerable groups did not suffer more than others from the impact of particular legislation. Hence the requirement for Cumulative Impact Assessments for studying the effect on any changes on groups like the disabled. But as this article shows, David Cameron and Theresa May have quietly altered the legislation demanding these, and so are loudly shouting that they can’t do a cumulative assessment for the disabled, because it’s too difficult. This is despite other organisations having done so. 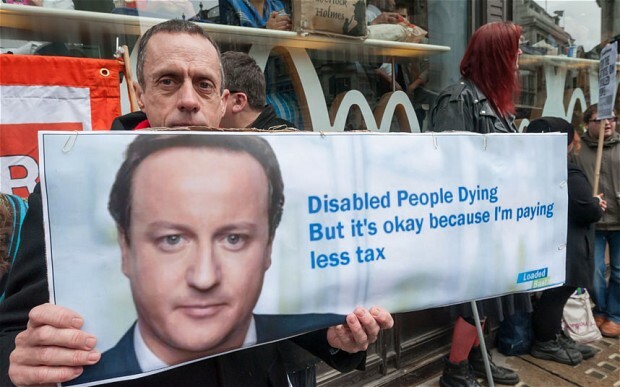 It’s a lie, of course, because the Tories well know how damaging their welfare changes have been to the disabled. Just as they know that despite IDS’ denials, forty people have taken their lives in despair due to benefit cuts. But the thrust of their legislation remains the same – tax cuts for the rich, mass poverty and misery for the rest of us.